As Rad you will navigate treacherous produce environments to get back to your roots. The inception of Rad happened about 17 seconds after winning a Patreon raffle from Melissa, the original genius and creator of Rad, as a soft sculpture. Lessons learned from Dozer’s Adventure: Plan. Oh holy hell plan, don’t wing it. You’ll avoid scope creep and maintain focus on what you want your players to learn about the game. After building Dozer’s Adventure, we had a burning desire to build another game. Fundamentally, when the pursuit of mobile applications (of the game variety) started back in 2007 - we were really focused on bringing the characters of Tomoko Uno’s creations into the digital world. The underlying goal of bringing an artists’ imagination alive in an environment and plot that furthered the backstory of one’s creations is still very much an ulterior motive. Woolbeasts creator and Double Bear Rolled team member Melissa Sue Stanley was holding a raffle for her Patreon supporters. The Wee Radish God was the prize and when the right name was pulled. That underlying goal reared its beautiful head, again. 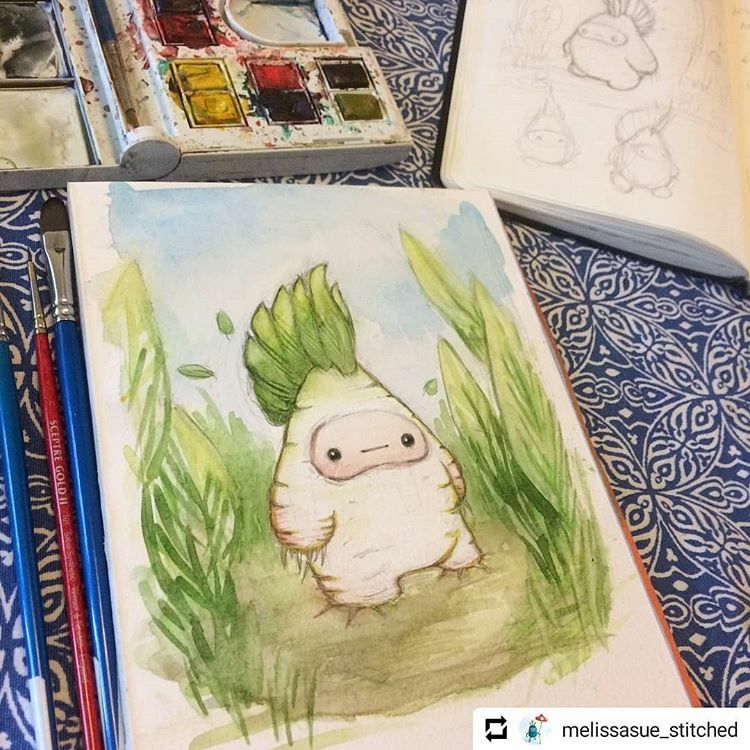 The accompanying watercolor portrait of Rad inspired a concept of an edible character being far from home and longing to get back. The puns surrounding the character being a radish and home being their roots made crafting a plot where the radish is far from home and in location that is none other than a veggie-crisper in a fridge. This concept quickly took shape, mapping out levels, and exploring literature around the fundamentals of game design. Akin to Double Bear Rolled’s motive of identifying what our team members want to learn and then crafting products around those themes, one of the fundamentals of game design includes teaching and instructing a player through different elements or mechanics of the game that the game’s developers would want the player to engage with when navigating the product. We scoped out 5 levels; 5 locations where we expected Rad to escape to get back to their roots. (Is it possible to overuse that pun?) From escaping a fridge through a broken ice maker, to navigating the counters and cabinets of the kitchen, Rad was both pressed for an undetermined timeframe while overcoming environmental challenges and the occasional puzzle to escape their surroundings. From the kitchen Rad navigates a garden, a ‘farm to table’ truck, and (since when Rad gets on the truck, the truck is closer to the ‘table’ than the ‘farm’) the final level of the farm where the rest of Rad’s wee radish buddies are hangin’ out. Along side 5 levels of varying length and difficulty, we knew we wanted to bring a unique experience to an otherwise overpopulated genre of mobile platformer games. Specifically, we set our sights on creating familiar interaction patterns and game mechanics, while having unique visuals and unique music. The combination of visuals and music lent itself (or perhaps we were destined to) pursue minor thematic elements for each level that centered on emotions. Our goal was set to evoke a specific emotion for each level centered on the challenges, puzzles, visuals, sounds, feedback, and all other elements (besides the (common) controls of Rad). We set ourselves up to put Rad (and the players engaged with Rad’s world) to experience curiosity, fear, courage, confidence, and calm, respectively, across the levels of Rad’s environment. The timing of the inception of this idea came in the Spring of ‘17, two breaths before summer erupted in Chicago. This already was going to pose challenges for the team to spend weekends locked in-doors coding, painting, and composing the different aspects of the product. We knew what we expected (or wanted) from each department - that unique experience. By appointing leads with an open order to “do whatever it takes” to bring each aspect of the application to life, we were off to a racing start. 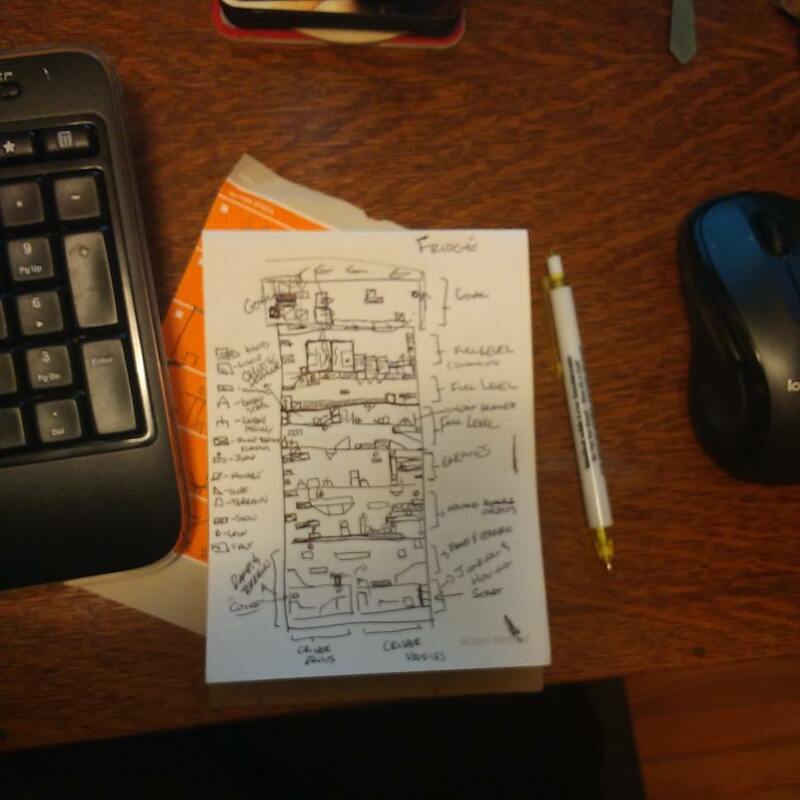 Within the first few weeks we had a working prototype of the first level (the Kitchen, aimed to evoke curiosity from the player) and enough testers in place to get some real feedback on the mechanics before adding any complicated visuals or audio cues into the mix. From the art department, we wanted to pursue a style we hadn’t seen in 30~ years of gaming: watercolours. There was maybe one game we’d seen published in recent years that leveraged a watercolour aesthetic, much less utilized actual watercolour paintings for their environments and characters. This approach we anticipated would provide a unique visual flavour and therefore appeal to attract gamers to help Rad navigate their world. If we were going to pursue cel animation, which was our plan, we were going to need a long lead time to paint each frame of each character or object we aimed to put into the product. Starting out, we were convinced the art department would have the critical path for this product. Anticipating a cel animation structure, our engineering team had to sort through how best to utilize the tools at our disposal to handle multiple frames. This includes challenges around how imagery is handled when the product is compiled, slicing and dicing sprite sheets versus standalone graphics, random clipping of imported or scanned imagery, the list goes on. At one point we found our selves staring blankly at sprite sheets from old 1980’s pixel-based video games to get an idea of how we’d animate Rad’s idle, walking, and jumping animation sequences. (“It’s been ###-days since the last eyeballs were bleeding.”) We were successful in exploring various animation techniques and queueing up the assets in our prototyped levels to receive final assets from our art department. From the musical side of the house, we recruited a new team member - one who hadn’t worked in a Double Bear Rolled capacity but had years of experience authoring original music and was a published recording artist. Putting parameters in place like the backdrop for a level and the desired emotion we wanted our players to feel when engaging with the product was enough information to start the creative process. While we didn’t have a good gauge or estimate on the timing it would take to author a single, targeted-at-emotion, original track, we anticipated in terms of complexity it would not beat out our art department as far as the critical path of the product was concerned. Then one of our team members discovered GarageBand and started testing out ideas. Suddenly inboxes and phones were exploding with messages of new loops, riffs, full-length songs, terrible flute solos, and varying adaptations of expressing the same emotion with different instruments available in the tablet-based, free-to-use-and-then-abuse-friends’-inboxes’ GarageBand. During the course of this product, over 100 full length songs have been crafted for Rad - Back to Roots. While we won’t overshare details of the musical process, here, it is fair to say that we scope-creep’d the hell out of the music department: Of those 100+ full length songs, we picked a few dozen we wanted to work into the game. Of those few dozen songs, we still wanted an authentic sound built into the audible experience of the game. So we started re-recording each of the selected song’s tracks with real instruments - from bass guitars to trumpets to grand pianos - playing the tunes we’d come to love was one thing, finding a means to setup a recording studio in each of our basements was a complete other challenge (that maybe we’ll get into details about another time). Concept art by the genius behind the original Rad, Melissa. Find her on Instagram as @thewoolbeasts. Sometimes when you can’t play the notes, you use your voice. And sometimes when you use your voice, you get carried away. 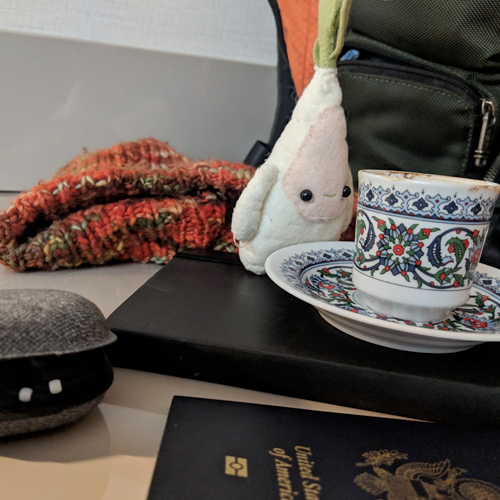 In the two years of working on Rad - Back to Roots, the pictured Rad travelled to Dominican Republic, Bulgaria, Iceland, Turkey (pictured), and Belarus. Also California, which is kind of like its own country, but what does Rad know of geopolitical situations, really? Rad - Back to Roots has not made it past our prototyping stage, and as of this writing has been shelved for a later release date. Much of what our team tried to accomplish worked well on paper, looked great in our plans, but what we were oblivious to (or didn’t have ample respect for) was the sheer amount of time it would take to craft completely new visual and audio material. We started this effort in the spring of 2017, and as we close on in on summer of 2019 we’ve learned an absolute tonne of information about the indie game industry, game mechanics, story telling through game mechanics, sure - ok - how to beatbox to some degree, and how to manage expectations when crafting something completely from scratch. It also didn’t help that we had lives. Some rumours we heard about the game industry (majors or the indies) was that many of the people involved in the creation of a game were under tight deadlines and air-traffic-controller -like stress to complete work related to their product. Here we are, a group of friends volunteering our expertise to attempt to build a product together, all the while maintaining our day jobs, family and social commitments, and coffee addictions. In the course of 2018 alone, our team members have changed jobs, got engaged, traveled to 5 different countries, won awards for their day-job work, created or been involved with other projects, all that meant the time spent on Rad - Back to Roots had to be focused and productive while sparse. Somewhere in there we had to sleep, too. So while Rad - Back to Roots isn’t a completely dead product, it is on pause for the forseeable future. Like Dozer’s Adventure, the lessons learned from this product’s endeavours will help inform our other products, our other teams, and true to the Double Bear Rolled mission, teach us lots of new context. In 2018, alone, over 100 full length songs were created by our team. The underlying goal of evoking emotions for players as they engaged with the application can be heard through this specific selection of tracks. From light and upbeat to dark and ominous, and even over to down-right-silly, the tracks built for Rad - Back to Roots sit waiting to be loved. Have a list at this small percentage of the library built for the product. The instagram video of a capella on the patio earlier in this narrative is featured below in “Spreadsheet Shuffle.” Along side the semi-hilarious track is another gem: “Overwatered Hibiscus.” - which has its own tangental story. Acknowledging we would need a guitar solo, but not having a clear idea of how to communicate where the solo should be placed across working files. An email should’ve sufficed, instead of our team sending that email, well, we managed to get as verbose as possible. Take a listen to the “MJ SOLO PLACEHOLDER EDITION” and we dare you not to laugh.